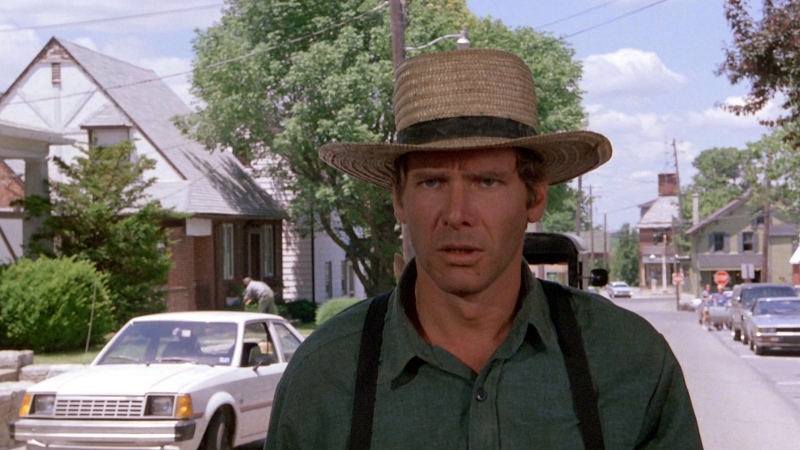 It's rarely spoken in the same breath as The Empire Strikes Back, Blade Runner, or Raiders of the Lost Ark, but Peter Weir's Witness (1985) is one of the best films in Harrison Ford's filmography. Typically skimmed over because of its rural setting and understated performances, Witness packs no shortage of intrigue after two distinctly different cultures intersect one fateful afternoon. 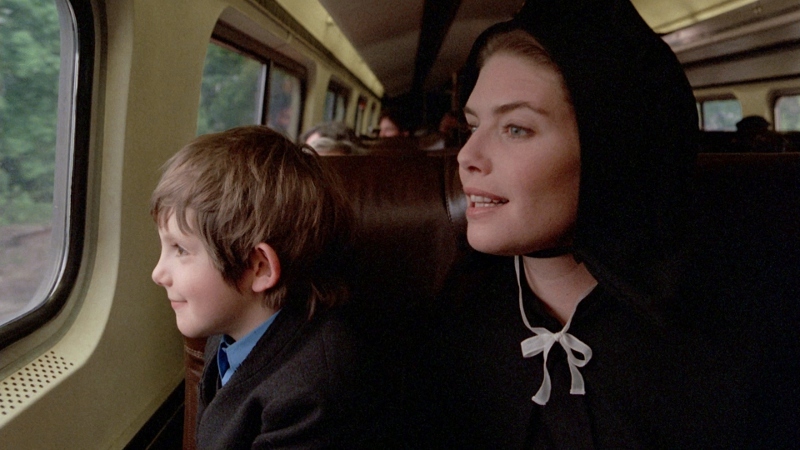 One side is represented by young Amish widow Rachel Lapp (Kelly McGillis) and her son Samuel (Lukas Haas); the latter witnesses a brutal murder at a train station bathroom in Philadelphia. He's questioned by local authorities, including Detective John Book (Ford) and his partner Sergeant Elton Carter (Brent Jennings), but the case takes a sharp left turn when the victim and suspect are revealed to be police officers. Naturally, Book wants to protect his valuable witness and, with few options, advises them to stay with his sister Elaine (Patti LuPone)...but after he confides in his boss (Josef Sommer) and is confronted by the prime suspect only hours later, Book knows the score and flees for Amish country with the Lapps in tow. Nursing an injury, he lays low in the company of Rachel's father Eli (Jan Rubes), Daniel Hochleitner (Alexander Godunov), and several dozen other members of the neighboring Amish in Lancaster County. Though tax records and occasional trips into town don't render them completely off the grid, Book will have to blend in while the Philly situation cools down a little. But, as Witness not-so-subtly points out, few are capable of a sudden and major lifestyle change, and Book is no exception: he's a proud man, unaccustomed to the 19th century mindset of his new brethren, and hopelessly attracted to Rachel. When it's time to make a decision, the inevitable showdown with his fellow officers makes it a little easier. 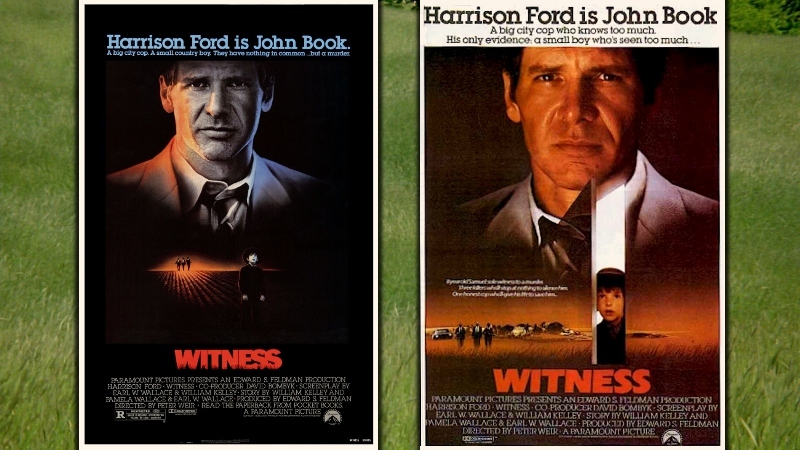 Featuring a terrific turn by Harrison Ford and fine supporting performances (keep an eye out for Viggo Mortensen in his film debut), Witness offers as many sudden tonal shifts as its story hints at. We're never in more than one setting for more than 20 minutes or so (the one exception being a more longer stretch of Book's "adaptation" about two-thirds of the way though), which leads to a stop-and-start pace that allows plenty of time to process and prepare for the film's bloody beginning and end. Maurice Jarre's terrific score also blankets the film in a period-specific atmosphere that's aged just a little---honestly, it wouldn't be too far out of place in Blade Runner---but very little else about Witness feels 30 years old. It's simply a well-paced, well-acted, and thoroughly original drama that's easy to get lost in. Perhaps its my close proximity to the Amish (location, not mindset) that makes almost everything about Witness feel so natural and organic...so if you're not at all familiar with the culture, your mileage may vary. Released twice on DVD by Paramount (first in 1999, then in 2005 as a Collector's Edition), Witness feels like an obvious candidate for high-def royal treatment with its unique atmosphere, score, and subject matter. Sadly, Warner Bros.' Blu-ray falls short: this is obviously the same barebones region-free disc released overseas almost two years ago, and most likely authored even earlier. Aside from lossless audio, there's not much to get excited about here, as the visuals are a little lackluster and the absence of the Collector's Edition DVD extras is downright insulting. Presented in a slightly opened up 1.78:1 aspect ratio (as opposed to its original 1.85:1 format), Witness looks...OK on Blu-ray. Overall, it's certainly better than the Collector's Edition DVD, which seemed fine in 2005 but now appears soft, murky, and riddled with noise reduction. Those aren't as much of a problem this time around, but it's still very uneven: outdoor shots are crisp and clear (if not slightly waxy at times), naturally-lit interior scenes are hampered by chunky grain and mosquito noise, and the color timing feels a bit colder than expected. But it's hard to accurately judge Witness as I never saw it theatrically, and can't pretend to assume which problems could be native to this Blu-ray and which are source material issues. This does appear to be taken from the same master as the DVD linked above, as evidenced by telecine wobble during the opening credits and a few other subtle clues. I'm fairly certain that there's still plenty of room for improvement here, although it's obviously a step up from standard definition. Although the DVD's Dolby Digital 5.1 still sounds good to my ears, it's easily outmatched by the lossless Dolby TrueHD 5.1 mix we're given here. Many indoor scenes rarely leave the center or front channels, but stepping outdoors widens the soundscape comfortably: from the clip-clop of horse hooves to insects and sudden bursts of gunfire, plenty of well-placed surround effects make Witness a surprisingly immersive audio experience. Maurice Jarr's terrffic (if not slightly dated) score also creates a commanding atmosphere, often occupying three or more audio channels without drowning out dialogue and background effects. Optional Dolby Digital 2.0 dubs are provided in German, Spanish, French, Italian, Japanese, and Portuguese. As for the subtitles, there are more than two dozen options including English, SDH, French, Spanish, Japanese, German, Cantonese, Czech, Danish, Greek, Mandarin, and many others. Though predictably low on style points, Warner Bros.' standard menu interface is clean, easy to navigate and loads quickly. This region-free Blu-ray is packaged in a standard keepcase with less attractive cover artwork than the DVD. No inserts or slipcovers are included. Sadly, the excellent bonus features from the Collector's Edition DVD (a feature-length production documentary, a deleted scene from the broadcast version, and the trailer) have not been ported over to this Blu-ray, which is extremely lazy on Warner's part. It seems that a number of current and upcoming Paramount catalog titles share the same fate, so let's hope this disappointing trend doesn't last for long. There's a lot to like about Witness: it's a forgotten little film that draws me in every single time, even if it doesn't beg for constant replays. The stop-and-start structure often lulls us into a sense of security before ramping up the tension, creating a comfortable yet unpredictable atmosphere at the same time. It's got a lot of staying power thanks to great performances, an unusual setting, and Maurice Jarre's terrific score. Sadly, Warner Bros.' Blu-ray misses the mark: video quality is slightly improved but still lacking, and the wonderful Collector's Edition DVD extras haven been dropped; in all honesty, the only marked improvement is lossless audio. Luckily, the low price tag makes it a decent DVD companion for die-hard fans, but this hidden gem deserves much better treatment. Mildly Recommended.